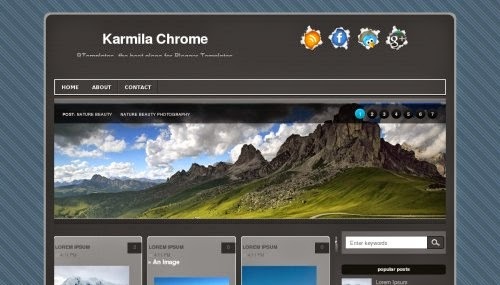 Karmila Chrome free blogger template sangat unik, Buat para blogger yang lagi nyari desain template, coba deh lirik gaya template yang satu ini. Template ini sendiri terdiri dari 2 columns, right sidebar, gallery-styled, rounded corners, exclusive design for Blogger, footer columns, slideshow, social bookmarking icons, posts thumbnails, breadcrumbs, related posts, a background pattern, related posts support and well formatted threaded comments. Terarik? Silahkan download disini Gratis.. ! !